WHY A MUSEUM OF THE MUSES ? A unique opportunity has arisen in La Creuse, Central France, for us to develop a superb Museum location as a centre for education, spirituality, the creative arts and peace work. Based at the Castle of the Muses in Scotland for 6 years, our work has now moved to Limousin to Le Musee des Muses as a permanent base. HOME TO THE INTERNATIONAL INSTITUTE OF PEACE STUDIES AND GLOBAL PHILOSOPHY (IIPSGP): The Institute is unique among research centres throughout the world in that it combines training and practical work in conflict resolution with studying the entire range of global philosophical and spiritual traditions, together with the proactive search for global responsibility, peace and justice in our time. IIPSGP was established in 1991 at the University of London. 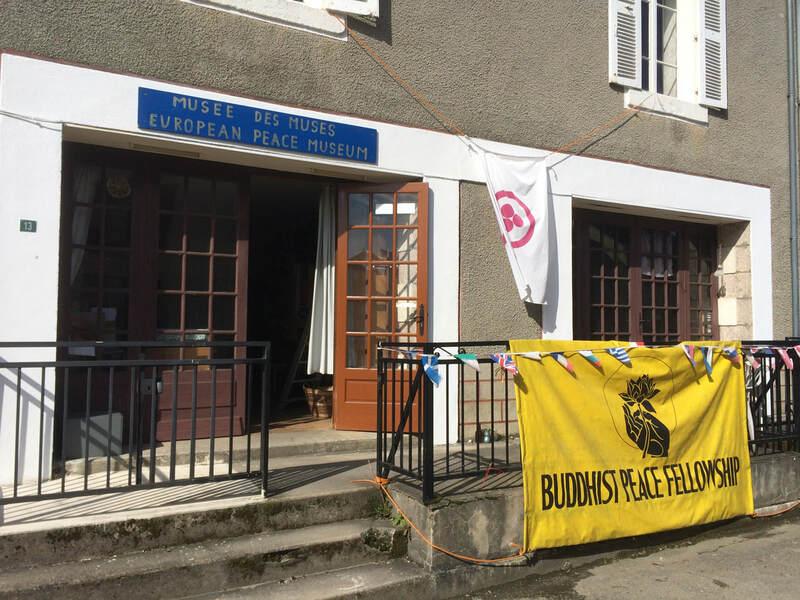 HOME TO THE EUROPEAN PEACE MUSEUM: We are a small private museum dedicated to the quest for peace and understanding in the world. Each of the 9 rooms of the Museum is devoted to a particular Muse, and contains books, artefacts, paintings and sacred objects associated with the traditional archetypal energy of that particular Muse. Another name for the Museum is there "The Museum of the Muses". HEALING AT THE MUSEUM – The Museum has a wonderful healing energy and is available for this purpose, as well as for massage therapy, and counselling and psychotherapy sessions. STUDY AND RESEARCH AT THE MUSEUM: this is a major feature of our work, and students and scholars are invited to visit the Museum to undertake research programmes and private study. HOME TO EDUCATION AID: The Museum is the base for this international fundraising charity. EA. is designed to help all of us generate both practical funding resources and new inspiration for educational work nationally, and globally. CENTRE FOR THE ARTS – the Museum also functions as a centre for exploration into the philosophy and practice of art and for workshops on spirituality and the arts. In Euterpe the Museum has collections of art works and space for artists to come and paint and work in various media and it is hoped the surrounding beauty of La Creuse will inspire artists to continue the Creusois tradition of outdoor painting and allow their own creativity to shine forth. TEACHING, TRAINING AND EDUCATIONAL RESEARCH: The Museum will function as a meeting place for everyone involved in education to think through difficulties and solutions to the global learning deficit. MEDIA OFFICE AND MUSEUM SHOP – Talks and lectures going on at the Institute can be shared more or less instantaneously around the world, via the Institute’s YouTube channel on IIPSGP1. Books and DVD’s and CD’s for sale are available in the museum shop. SCHOOLS AND COLLEGES: the Museum is open for teachers and pupils from across Europe and France to come and share ideas and discussions and teachings about different cultures, philosophies and religions and how all Europeans can learn to live in peace together. ​POETRY AT THE MUSEUM: The Museum is home to the International Order of Peace Poets and hence occasional poetry evenings will be taking place here. An annual conference on poetics and peace is also scheduled. MEDIATION SERVICES: the Museum is home to the work of the Multifaith and Multicultural Mediation Service and the Mediation Service for Higher Education available for consultation throughout Europe. CENTRE FOR THE STUDY OF DIVINE INTELLIGENCE: This new initiative aims to bridge the gap between science, spirituality and religion and has held three meetings to date. Inspired by A.R. Wallace, friendly rival to Charles Darwin, we aim to find verifiable scientific evidence for exploring the hypothesis that there is indeed a Divine Consciousness at work in evolution. Unlike Darwin, Wallace was interested in spiritualism and evidence for survival of consciousness after death, and became convinced that this was true. The implications of this data for scientific theories of the evolution of life are considerable, and also for an understanding of the scientific basis of ethics.